Ok, I’m sure some of you took a look at the title, and said to yourself, or perhaps out loud, “you’re going to have to show me on this one Ted.” Especially you women. Well, please bear with me and see if it isn’t true. The other day, Alice had a dental appointment, and I had some work to do in town, so I drove her. 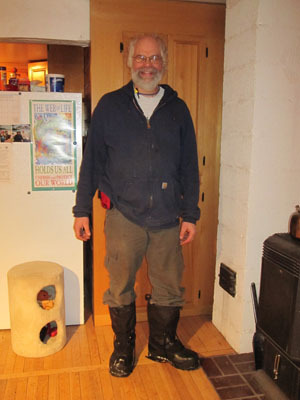 Since the in-town project was outside, I wore my winter boots. Now these are serious boots. I dislike cold feet, but equally dislike being stuck inside in the winter, so I got some warm boots. They are 16″ tall, with full felt liners inside. 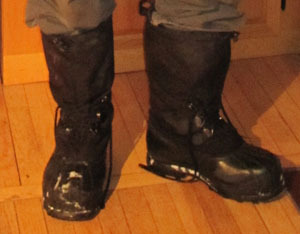 These are the boots snowmobilers wear. While Alice was at the dentist, I did my outside project, but was vaguely uneasy all the while. I usually drive my truck, which is a big F250 Super Duty with lots of pedal room. Today though, we drove the car, a Pontiac Vibe with a stick shift. With my big boots on, I could, by wiggling my toes just right, put the clutch in and hit the brake. I was pretty sure, though, after the experience of driving to town, that if I were to have to make a quick maneuver, that my feet could get tangled up. So here is what I did. When I picked Alice up, I ASKED HER TO DRIVE. I almost never ask her to drive, and she seems very content to be the passenger when we ride together. She is a fine driver, but for some reason, over the years, driving is one of the things I’ve just done. I did some rewinding, and couldn’t really think of another incident where I’ve felt that my driving might not be safe and asked for help. Me! Asking for help! As if. So there you have it. Proof that as we age, we can possibly get smarter. An anomaly, you suggest? You might be right. In fact, you probably are right. For now though, I’m glowing with the knowledge that I’m on a run of one in a row. This entry was posted on Saturday, February 1st, 2014 at 9:47 pm and is filed under Uncategorized. You can follow any responses to this entry through the RSS 2.0 feed. You can leave a response, or trackback from your own site.